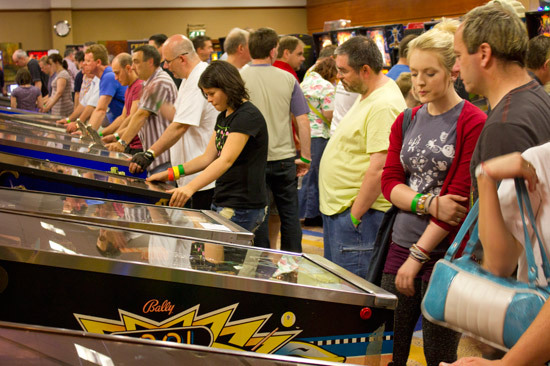 The UK's biggest pinball event returned in 2011 with the familiar mix of free play games, tournaments, parts vendors and plenty of socialising. 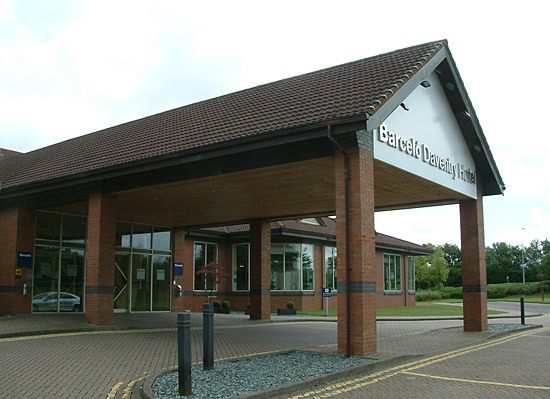 We were back at the Barcelo Daventry hotel for a second year where the indoor pool, sauna and spa room offered a chance to relax from all the frantic pinball action taking place in the Danetree Suite. 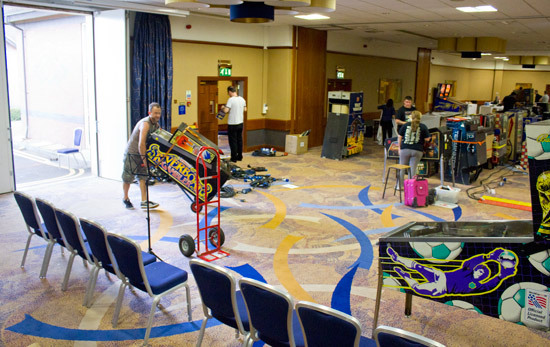 UK Pinball Party organiser Andrew Heighway picked up machines across the country and delivered them to the hotel before the main set up began on Friday, which meant there were quite a few games waiting when the first owners rolled up with their vans. 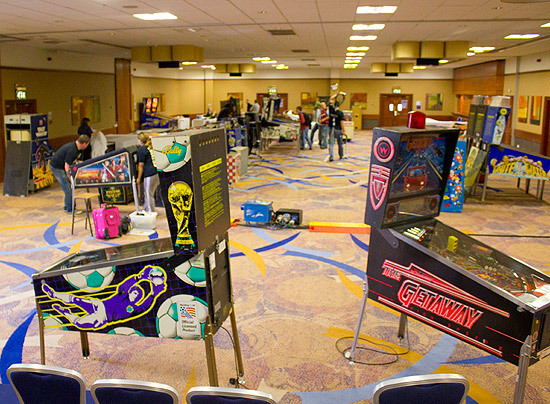 The hall was split into two areas, the main part at the front contained all the free play machines and the vendors, while the back section was home to all the tournaments run over the three days. The show opened at 5:30pm on Friday evening and continuing through to 5pm on Sunday. The hall closed around 11pm on Friday and 7:30pm on Saturday to make way for the awards dinner. Entry cost £7 ($11.50) for Friday, £12 ($20) for Saturday or Sunday, or there was a three day pass available for £25 ($41). 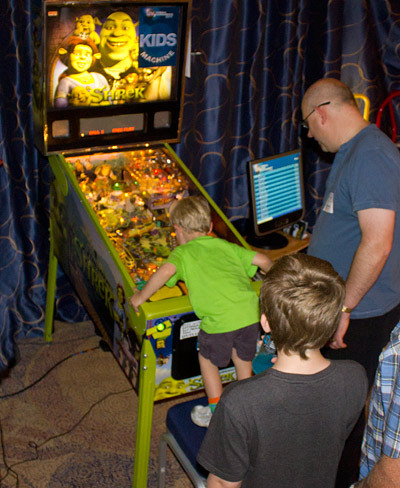 Each paying adult could bring in a child of 12 years or under for free, and all the non-tournament machines were on free play. 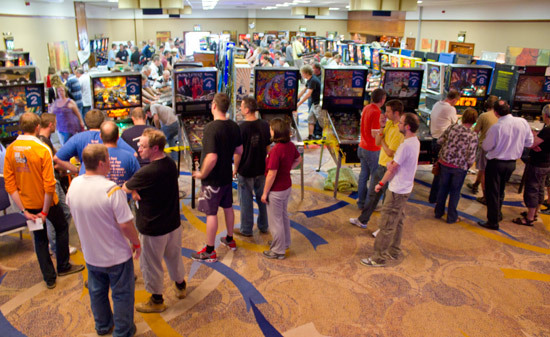 Entry to the tournaments cost extra, as did the two high score competition machines next to the front desk. As opening time drew nearer, the different pieces of the show began to fall into place. Fewer machines were on their back and more were on their legs, gaps in the rows began to be filled, while monitors and projectors started showing images from the tournament scoring system. 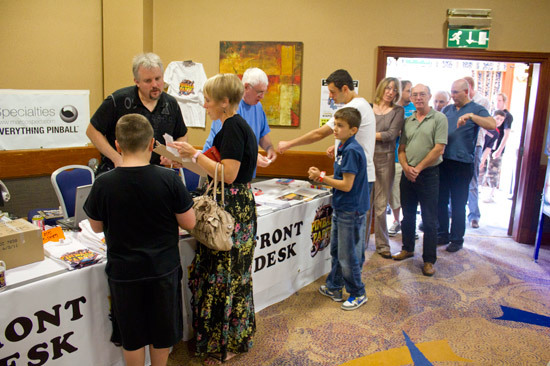 There were sizeable queues at the start of each day's session but visitors were soon through the door and receiving their wristbands at the front desk from show organiser Andrew Heighway and his family. Inside they found two back-to-back rows of machines running the length of the free play area. On the right side were the two newest games at the Party - a Tron Pro and a The Rolling Stones from The Gamesroom Company. Both were very busy for all three days and this was the first time Tron had been at a show in the UK. Next to these were two high score competition machines. 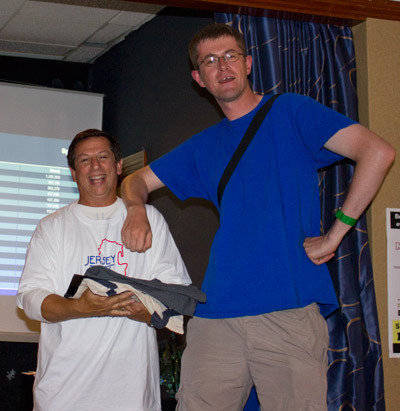 The High Score Shootout was played a Cactus Canyon while the Marco Masterplay competition took place on Monster Bash. 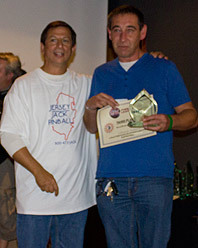 Marco Specialties was the official sponsor of the show and sponsored this competition too. Both machines were set on free play on Friday night to give competition players some free practice time. Standing next to the Cactus Canyon was a Pool Sharks which was the grand prize in the charity raffle held on Sunday afternoon. On the other side of the front desk were two MarsaPlay New Canasta machines brought by Andrew Heighway. 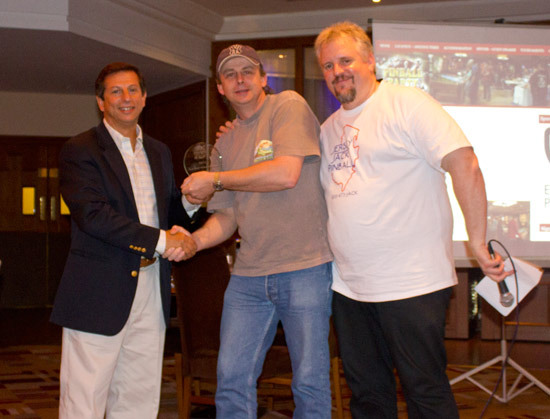 Andrew is an official distributor for the New Canasta games and this was the first time they had been exhibited outside their native Spain. Standing next to the MarsaPlay games were a Corvette and a Twilight Zone. But these were looking rather different to their way they usually look. The reason? They were set up by Dominic Clifton and Ewan Meadows to show the possibilities of the the FreeWPC system. FreeWPC allows anyone to write their own rules and create their own display animations and light effects. These are then written to a new ROM which replaces the one installed in the game. There was also a seminar about FreeWPC on Saturday afternoon. More about that later but here's a list of the 101 machines set up in the hall on Sunday morning. 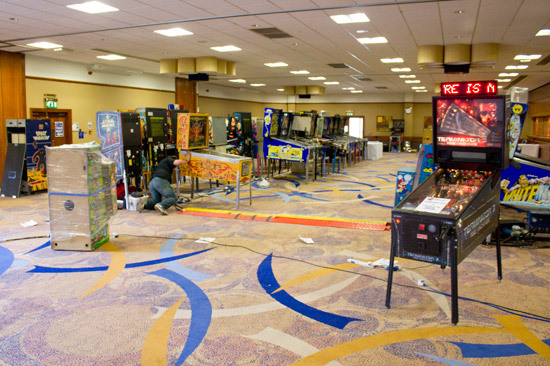 In addition, the Cactus Canyon and Monster Bash were configured as tournament machines for Saturday and Sunday, to give a total of 101 machines set up to play. Also, some unlisted machines may have been brought in, sold and removed before this list was compiled on Sunday morning, but the total number will have been a little over 100. There were various cleaning materials for sale at the front desk alongside UK Pinball Party mugs, T-shirts and posters. 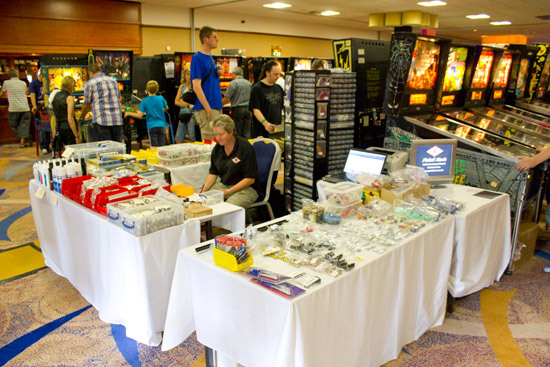 However, the main vendors at the show were Pinball Mania and Pinball Heaven who brought a wide selection of common pinball parts, and Gary Flower who had a good range of parts, manuals, plastics, translites, flyers and much more. 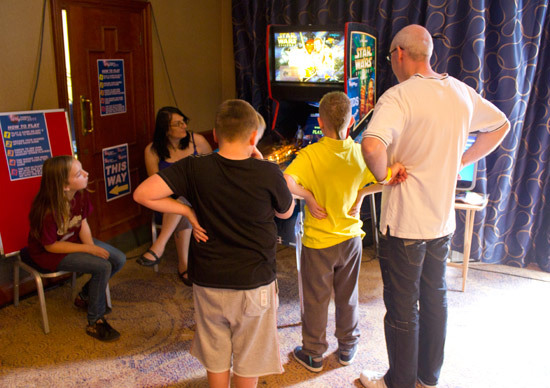 Andy from Pinball Mania also provided tech support for the Party which kept him busy pretty much throughout as one machine or another buckled under the strain of constant play and the warm temperatures inside the hall took their toll. 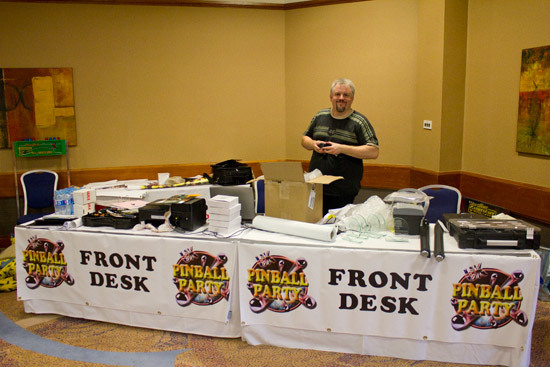 Gary's stand was where the UK Pinball Party's special guest Jack Guarnieri of Jersey Jack Pinball made his home, when not wandering around talking to visitors or making presentations on the stage. There was also a stand promoting the Replay show to be held in Blackpool this November. 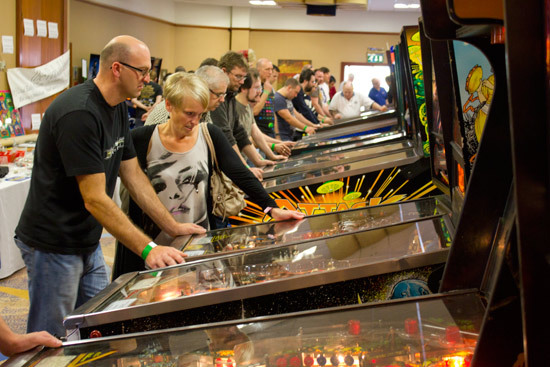 One of the highlights of that show will be the Northern Lights Pinball - a collection of more than 50 machines with the aim of introducing (or re-introducing) pinball to the general public, rather than just appealing to existing pinball fans. 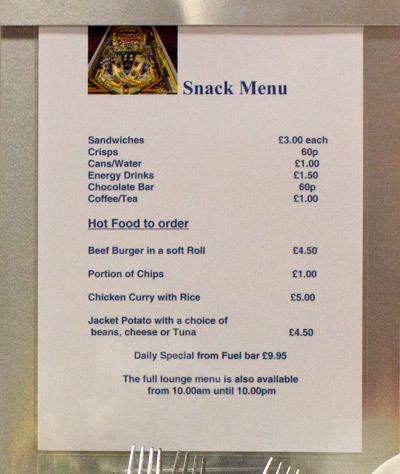 If it was food or drink you were after, the front left side of the hall had a bar and a food service area where sandwiches, burgers, chips, curry or jacket potatoes could be purchased much more cheaply than in the main hotel bar area. In addition, Party attendees could purchase certain drinks at a special show price from any of the hotel's bars. A pint of Carlsberg was £3.90 ($6.24) at normal prices but £2.80 ($4.48) for show visitors, and lime & soda was a mere £0.60 ($0.96). The reduced drinks prices weren't well publicised but word soon got around and the hotel staff were even kind enough on occasion to refund the difference for any drinks bought before the deal was known about. Here's our Three Minute Tour video of the show floor made on Sunday morning. 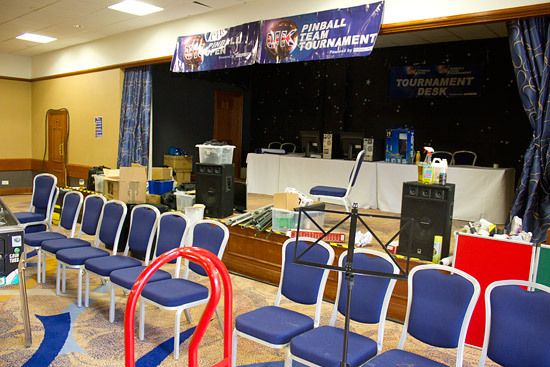 Meanwhile, down at the other end of the show hall, the first of the 5 tournaments was being prepared on Friday evening. 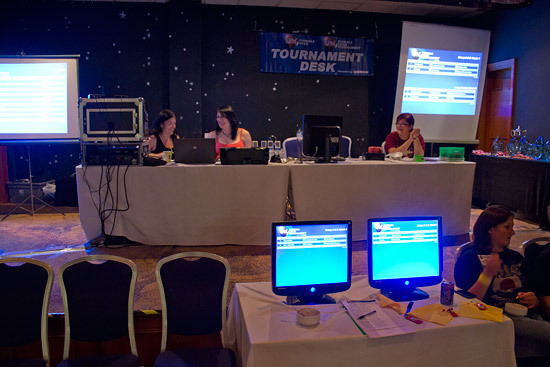 The tournaments area consisted of a registration desk on the stage, flanked by 2 projector screens. It was here that all announcements were made, awards presented and the charity raffle winners drawn. As usual, the tournament scoring system was run by Phillip Eaton and Dawn Raison, with Anne Raison, Adeline Eaton and Jayne Raison running the registration desk. 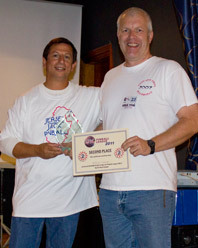 They were ably assisted by Sal Langley and the overall Tournament Director was Martin Ayub of Pinball News. In front of the stage were 2 video monitors showing detailed score information, while seating allowed players and spectators to watch the action on the bank of 14 machines arranged in an arc around the stage. 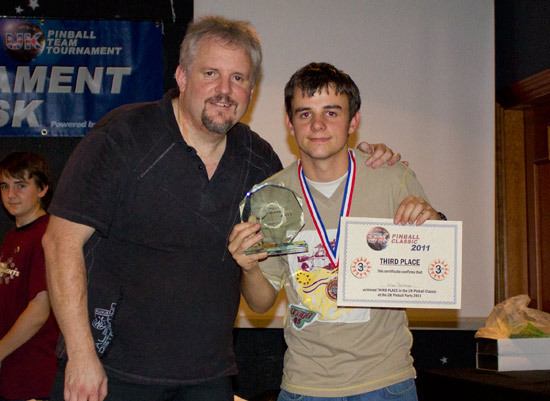 Also on the stage were the trophies, medals, certificates and prize money for the winners of the various tournaments, as well as the UK Pinball League who were holding their finals at the show too. 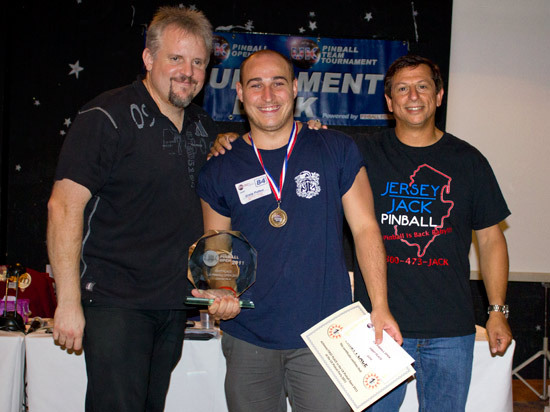 First to be contested was the UK Pinball Team Tournament headed by Nick Marshall. This consists of 16 teams of 4 players, playing an initial qualifying round with 4 groups of 4 teams. The top team from each group would then proceed to a 4 team final. Each team then played a 2-player, 4-ball game against each of the other 3 teams in their group, with each team member playing 1 ball of the game. The winning team in each match scored 5 match points, the losers zero. That meant by the end of the 3 matches, a team could have a maximum of 15 points or a minimum of zero. Then, each team in a group played a bonus game on a pre-selected machine. Once again, it was a 4-ball game with each team member playing one of those balls to give a total score. The team with the highest score of their group earned 9 match points, the next team 5 points, the third team scored 2 match points and the lowest scoring team earned no points. This allowed a maximum of 24 points for the qualifying round for any team. 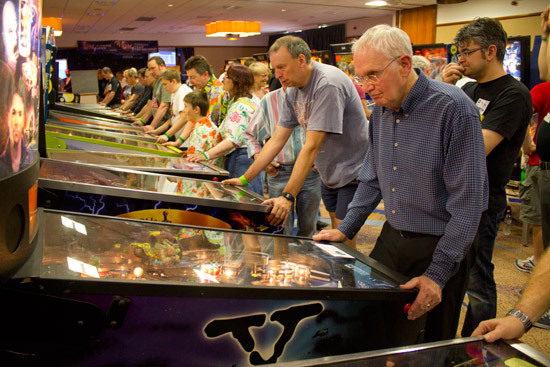 The teams played their matches on the 14 machines set up in the tournament area. These would also be used for the next day's UK Pinball Open. Last year some of the machines were changed between the Team Tournament and the Open the following day, but as each player only got to play one ball on each machine they played on Friday, there was very little advantage to be gained by also playing in the Team Tournament and so the same machines were used for both. So the Modfathers (Pt 2), the Creatures from the North, the French Frogs and the South West went into a single 4-player, 4-ball game on the randomly chosen finals game, which was Fish Tales. Fish Tales had replaced World Cup Soccer which had developed a rebooting problem earlier in the evening. 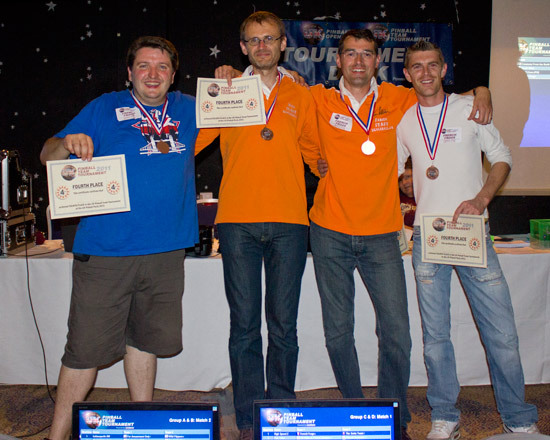 The Creatures from the North were thus the repeat winners of the UK Pinball Team Tournament, having won it the previous year too. 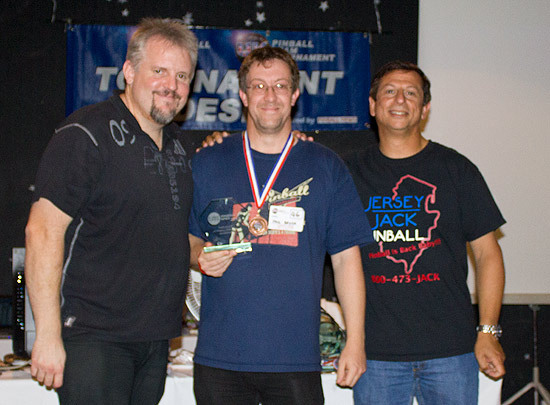 The Team Tournament final brought the events in the tournaments area to a close for Friday. The show continued until 11pm when the power was switched off and everyone either retired to the main hotel bar, went back to their rooms, or went out to get something to eat. Saturday rolled around and the show hall re-opened at 10am. 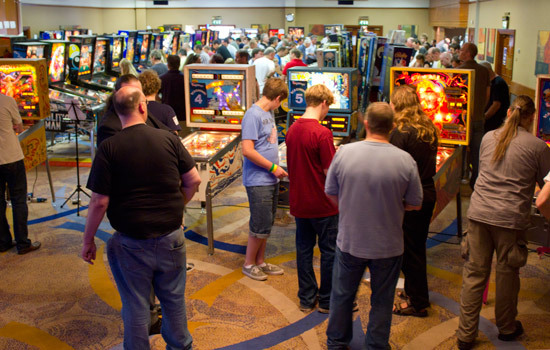 A few more machines had arrived and the lines of games were fully occupied. 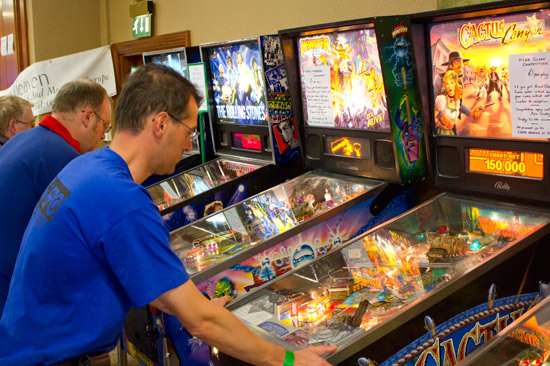 Down at the tournaments end, there had been the addition of a Shrek as the UK Pinball Kids Tournament machine, but there were no changes to the main line-up of machines as the major individual tournament of the show - the UK Pinball Open - got under way. 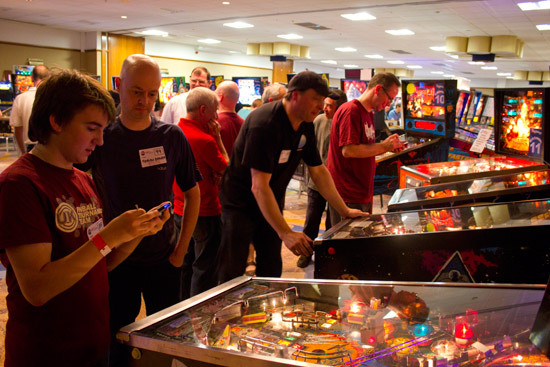 Last year, the UK Pinball Open pre-registered 60 players and added another 24 though on-the-day entries. This year the numbers were increased so that 84 players could pre-register their places. When these went on sale at the beginning of July, they all sold out in a record time of just over 30 hours, leaving several players unable to register and join in the fun. The team considered ways of incorporating more players and agreed to add another 2 machines to last year's 12 and put an additional dozen places on sale. These also sold out quickly but with 96 pre-registered players, it was thought no more places could be offered at that time. 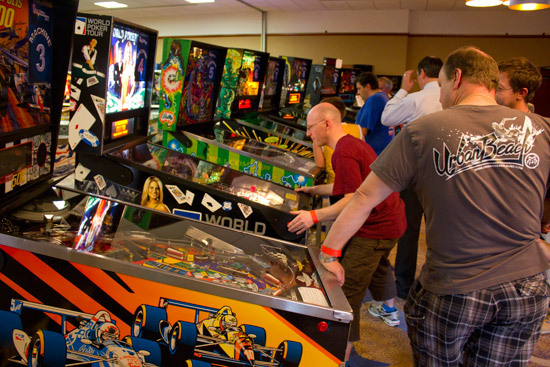 More places may become available during the tournament, but these would only be sold if it appeared there was sufficient time and enough free machines to accommodate the extra players. That decision would be made at three specific times during Saturday and names called from the waiting list if more players could be accommodated. 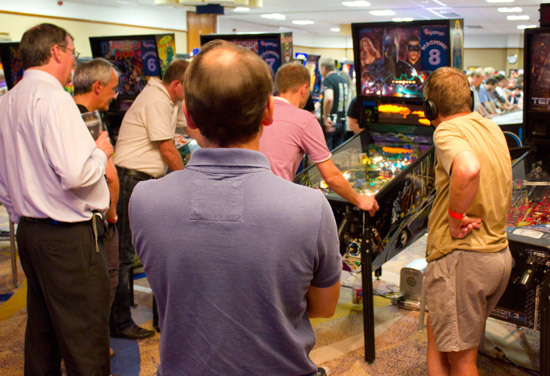 The format for the UK Pinball Open remained the same. 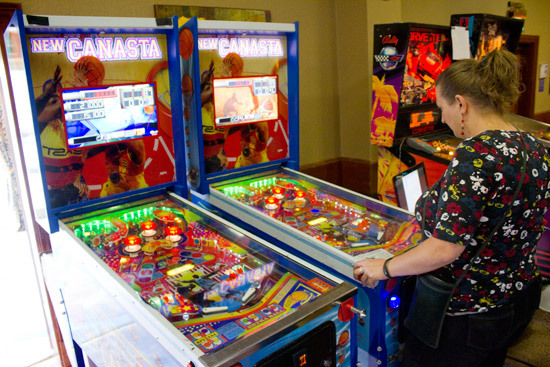 Players could choose any 6 from the 14 machines and play a single 3-ball game on each. 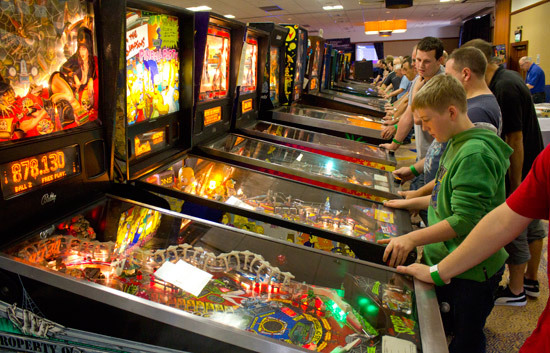 Their score on each machine would be ranked alongside everyone else who played it, and ranking points awarded with 100 points for the top score. The total ranking points from their 6 machines formed that player's total score. Thankfully, players heeded the advice not to leave their games too late and risk missing out on playing all their games, or not being able to play the machines of their choice. While the Open qualifying was entering its final hour, a seminar on the FreeWPC open source programming environment was starting in the adjacent Priestly room. Ewan Meadows and Dominic Clifton were explaining how a typical Williams WPC game operates and how FreeWPC allows you to rewrite the games' code to completely change how it works, create your own modes, scores and objectives, and produce new dot matrix display and light effects. 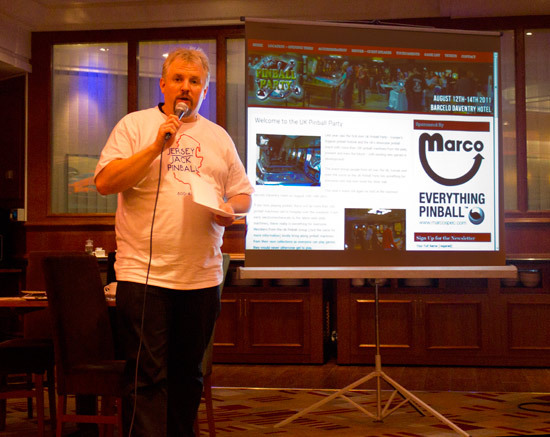 Ewan spoke about the history of the project from its beginnings in 2005 through to the first operational game in 2008, and the current state of the system. Once the code has been written, bug-fixed and checked, it can then be burned onto a regular ROM which completely replaces the existing game code ROM, meaning there are no copyright issues as none of the original code is used. 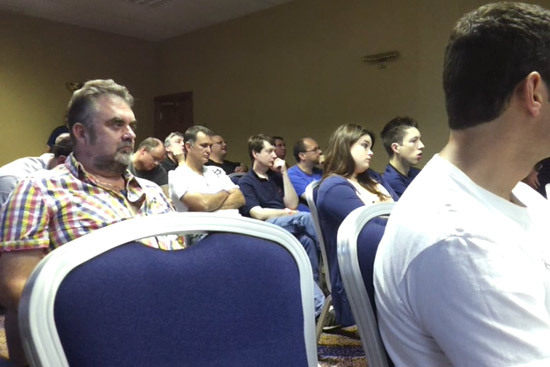 The seminar attracted a good sized audience who came away understanding the tools available to aid development, the techniques used to perform the common housekeeping tasks, the community support available and the possibilities FreeWPC creates for them to produce a truly unique game. 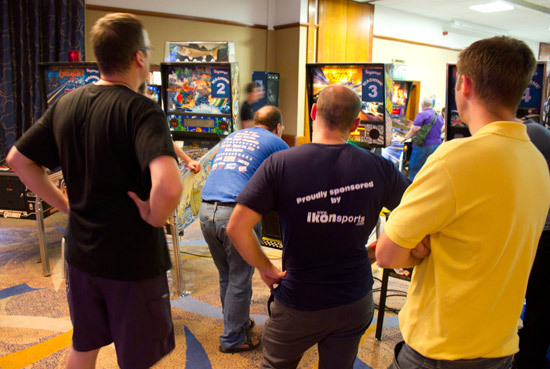 When the close of the UK Pinball Open qualifying round came around at 4pm, all registered players had completed their six games. In addition, everyone who had put their name on the waiting list for any on-the-day places was also admitted, thanks to a small number of last-minute cancellations. 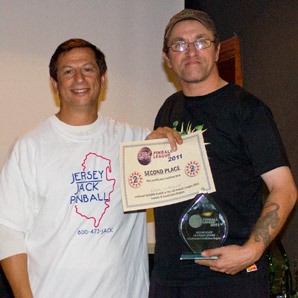 The top 24 qualifiers went through to the A Division play-offs but new for this year was a B Division. The next 16 qualifiers (25th - 40th) qualified for the B Division play-offs unless they were in the top 250 players in the world (by WPPR ranking) or have won a major tournament/league final. In that case they dropped out and were backfilled by qualifiers in 41st, 42nd, etc. 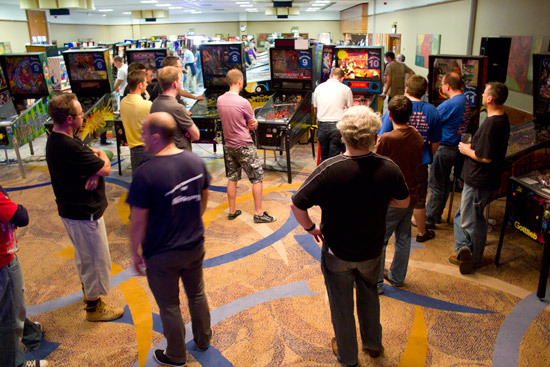 The A Division started first and used 12 of the 14 machines, with the 24 qualifiers paired up to play 4 x 2-player games on 4 different machines with different partners each time. 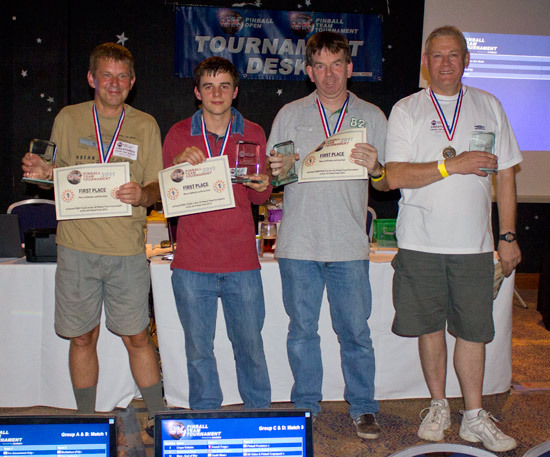 When all the matches had been played, the scores on each machine were ranked with 100 points for the top score, and ranking points totaled for each player. The top 8 ranked players would then go through to the semi-finals. 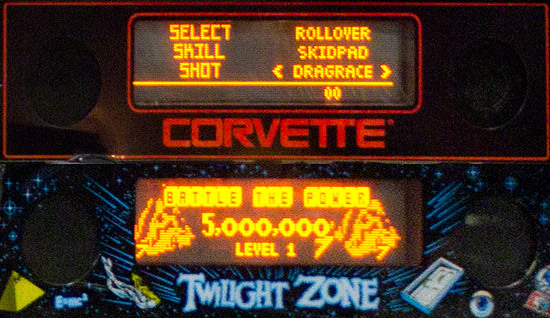 Before each new game, both players were given 30 seconds of play to get a feel for the machine, and find out its tilt sensitivity and flipper control. After one player had played their 30 seconds, the other player had their turn. When the minute was up, the machine was reset and the real game commenced. The top 8 players went into two semi-finals. Players ranked 1st, 3rd, 5th and 7th played in the first semi-final on Indianapolis 500, while the 2nd, 4th, 6th and 8th ranked qualifiers played on Batman Forever in the second semi-final. The top two players from each semi-final would go forward to the final while the bottom two would play for 5th-8th places. So we had our four finalists. 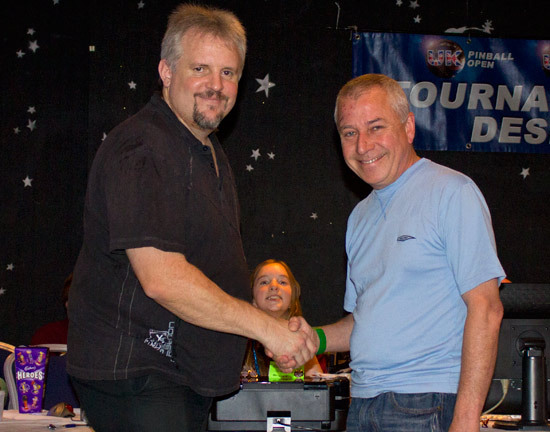 The machine for the final was drawn at random by UK Pinball Open head Richard Wade (after removing the two semi-final machines and any machines not working 100%). 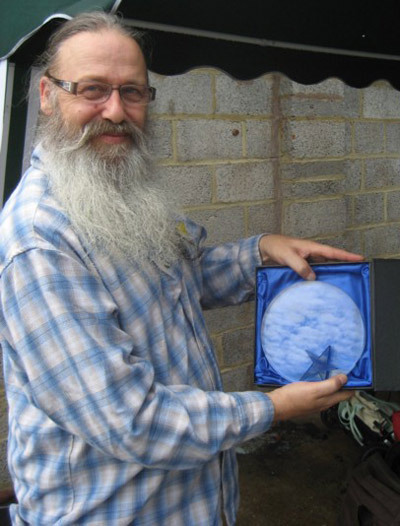 He selected Bram Stoker's Dracula for the final and Attack from Mars for the play-off for 5th-8th places. 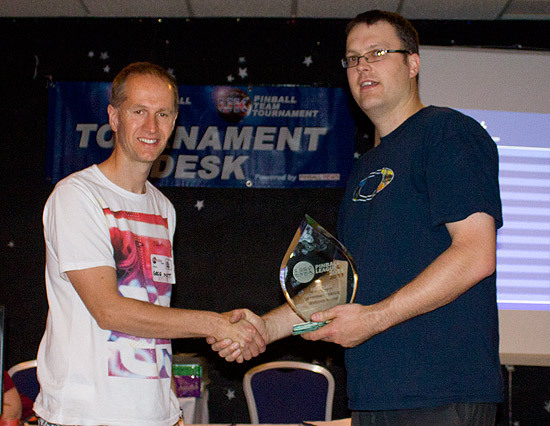 While the A Division play-offs were taking place, Phillip Eaton was looking after the B Division play-offs. 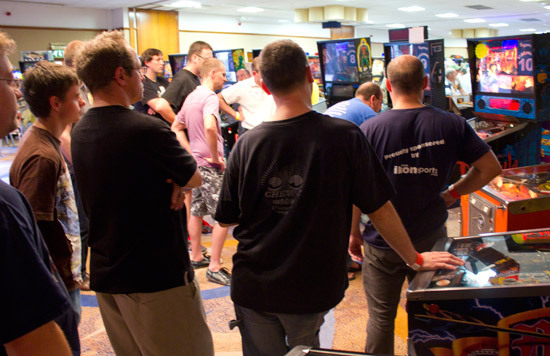 The 16 qualifiers were split into 4 groups of 4, and each group then played a single 4-player game on one of machines 13 or 14 (Stargate and The Addams Family) which were not being used by the A Division. As with the A Division semi-finals above, the top 2 from each game went through to the B Division semi finals, which was another pair of 4-player games, where the top 2 from each went into the B Division final. The 8 top players played their semi-finals on the machine they didn't play in the play-offs. The Stargate developed a fault display towards the end of the game and only flashed up the score very occasionally. 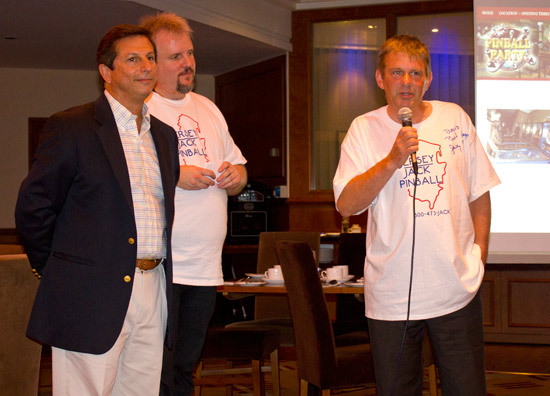 All players agreed that the scores recorded were approximately correct and that the outcome was the right one. The A Division 5th-8th play-off started first on Attack From Mars with the B Division final starting shortly after on World Poker Tour. 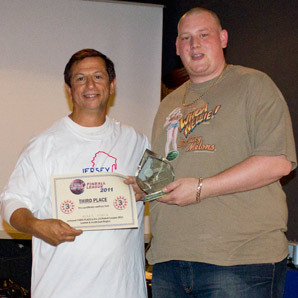 The very first B Division final saw a win for Dave Langley who took a commanding lead on World Poker Tour to become the B Division champion. 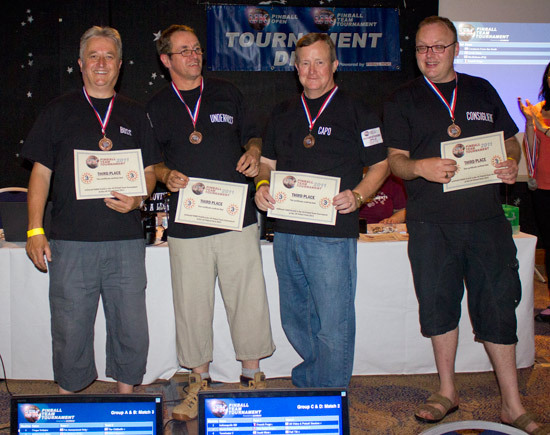 Which brought us to the A Division final between Johan Smaros, Craig Pullen, Greg Mott and Phil Dixon. Johan was the first to play and he drew out a decent lead with a score of 11M compared to all other players who had scores in the 2M range. But things turned around on the second ball as Craig bumped his score up to 60M and Greg up to 20M, while Johan only managed 14M and Phil was in fourth on 8M. The third and final ball decided it. Johan played well and added over 50M to his total, ending on 68M - 8M ahead of Craig. But Craig wasn't cowed by being overtaken. Just the opposite in fact, as his third ball doubled his score to 118M, giving him a huge lead of nearly 100M over Greg and Phil who were the only ones who could deny him a victory. 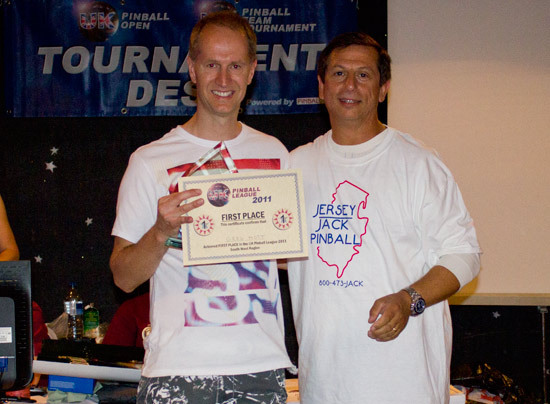 Greg played as well as Johan, lifting his score to 78M and taking him into second place. Which left Phil to decide the outcome. While he finally got a decent roll of the ball, Phil's 58M total wasn't enough to change the order, leaving Craig as the winner, Greg in second, Johan in third and Phil in fourth. 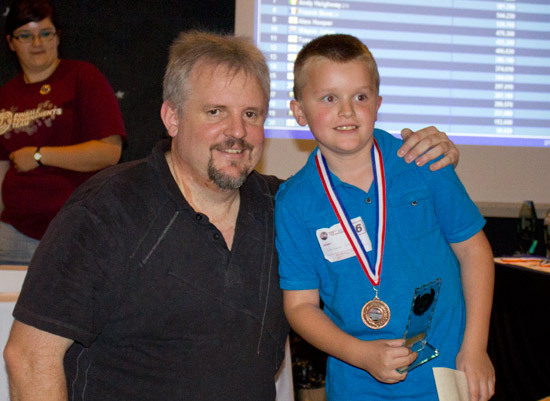 Once the final was over, the winners received their trophies, cash prizes, medals and certificates. 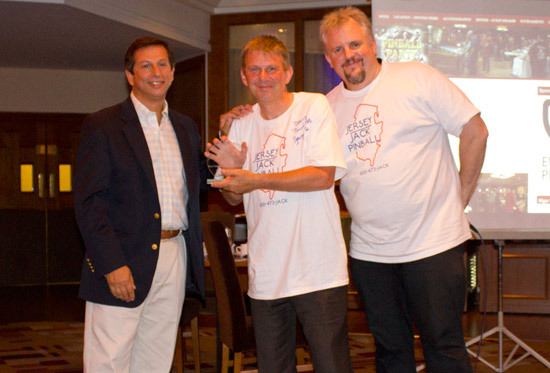 They were presented by Jack Guarnieri and Andrew Heighway. Then came the A Division top four. 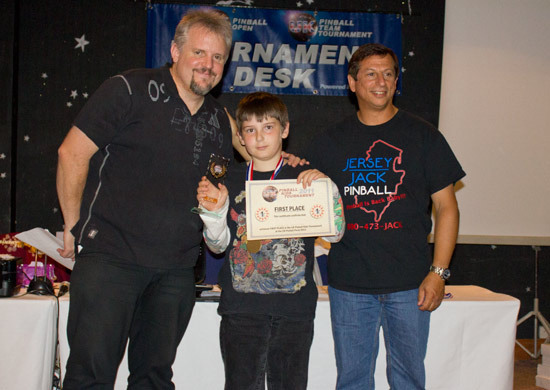 Saturday was also the first day of the UK Pinball Kids Tournament. There were two tournaments for youngsters aged 14 or under, one on the Saturday and another on Sunday. Each day used a different machine and it was Shrek on Saturday. 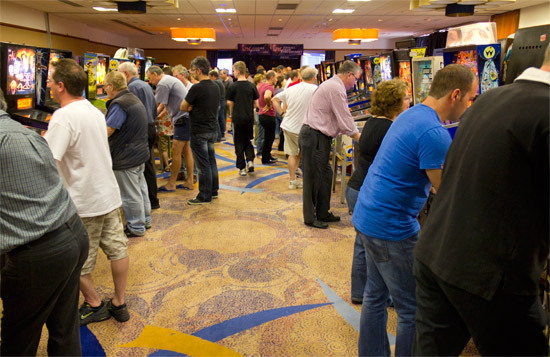 The choice proved to be very popular, giving the highest number of entries and the most players ever, possibly encouraged by the halving of the entry fee to just £0.50 ($0.80). Even not being tall enough to see the playfield was no obstacle to playing. You're never too young to play pinball! 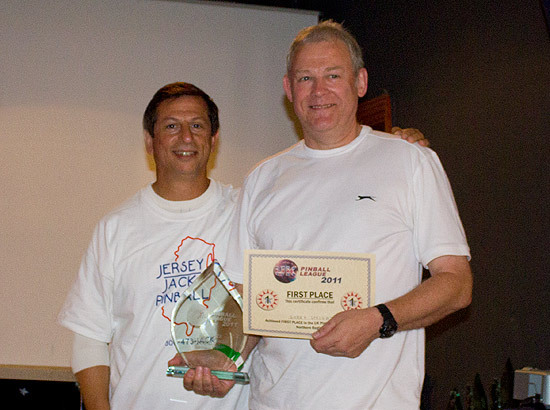 The battle for the top score lasted all day, but it was Timothy Raison who put up 63M and held on to take first place. 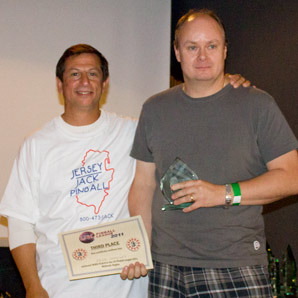 Second place was Jack Millband who unfortunately couldn't stay for the awards ceremony, while third was Adam Bona. With all the competitive events for the day completed, it was time to shut the hall at 7:30pm and for everyone to prepare for the evening's special awards dinner. But before the hall emptied completely, there was just time for Jack Guarnieri to join the show organisers and helpers in front of the stage for a group photo. Dinner guests assembled in the foyer bar and the room for the dinner opened soon after the scheduled start time of 8:30pm. The three-course meal was served soon after. Tickets for the awards dinner cost £40 (discounted to £35 as part of a room package). Once the meal was over, Andrew Heighway stood up to thank everyone for coming and those who helped make the show and the dinner happen. Then it was time for the first awards of the evening to be presented. This year for the first time, the visiting public were invited to vote for their favourite machines of the show in four categories - Best DMD, Best Non-DMD, Best Restoration and Best Modded Machine. 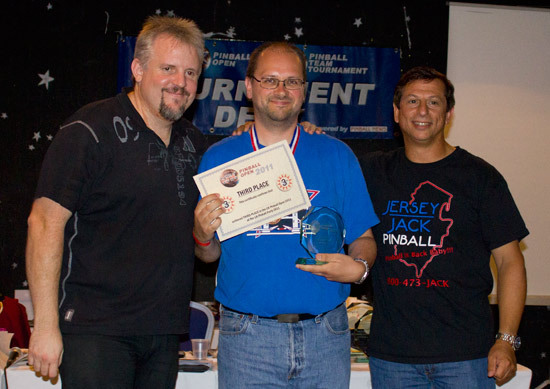 Darren Ball won two of these for his beautifully restored Attack from Mars which took the honours in the Best DMD Game (sponsored by Pinball News) and the Best Modded Game (sponsored by Marco Specialties). 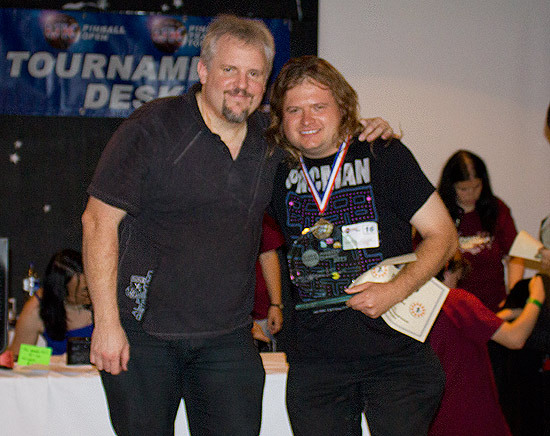 The best non-DMD award (sponsored by Pinball Mania) was won by David Dutton for his Cowpoke. 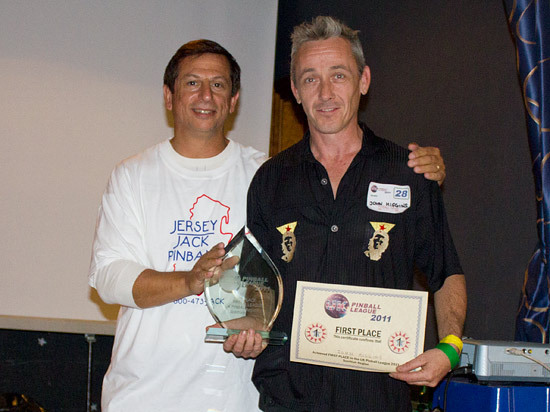 The final visitors' choice award was for the best restoration (sponsored by Pinball Heaven) and that went to Dave 'The Taxman' Edwards for his lovely Hook which was set up in the hall and drew many admiring looks. 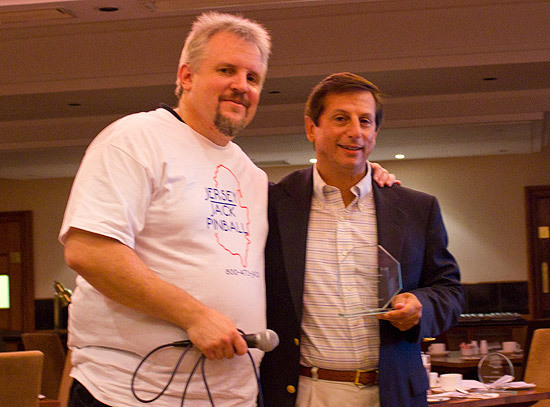 Dave wasn't at the dinner but received his award later. 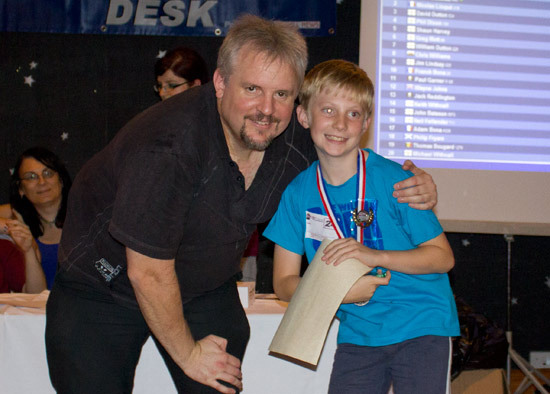 The final machine award was the Best Machine at the Show (sponsored by Pingame Journal) and was chosen by Jack himself. It went to the aptly-named Jack-in-the-Box from David and William Dutton. 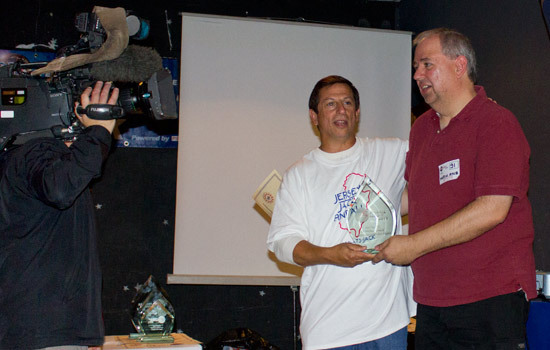 Jack explained the award was not only for the excellent condition of the game, but also because of the story behind it, which David related. 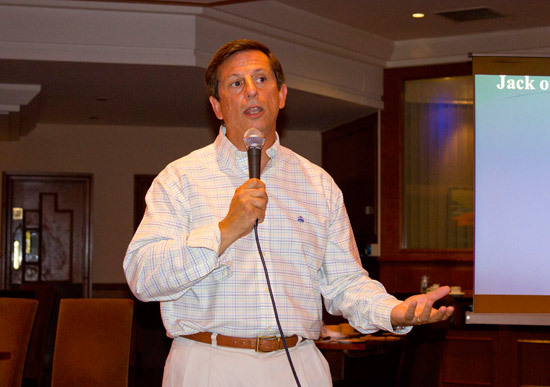 David told the audience how the game has special sentimental value because his hunt for the Jack in the Box led him to meet the woman who has been his wife for the past 25 years. 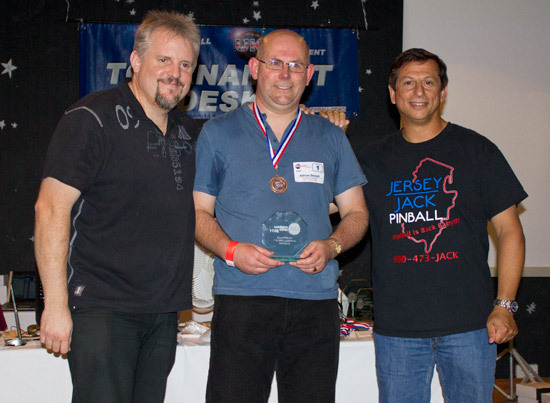 With the best machines at the show honoured, the awards moved on to the newest inductees to the UK Pinball Group Hall of Fame. 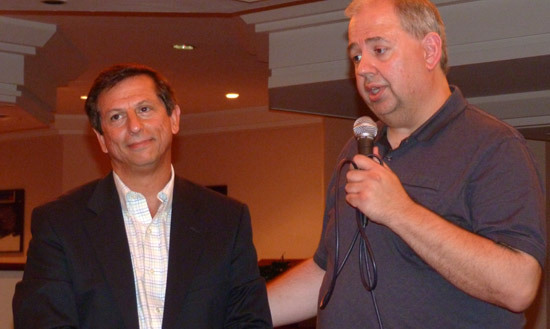 The Hall of Fame began in 2008 and has so far inducted John Trudeau, Martin Ayub, Andy Netherwood, Steve Ritchie, Gary Flower, Nick Bennett, Dennis Nordman, Gary Stern and Mark Squires. Tonight three more names would be added to that list. 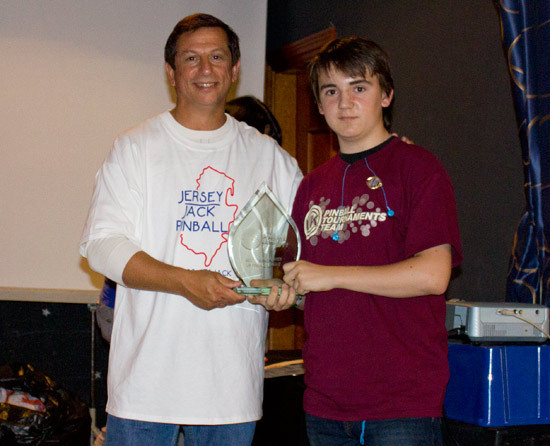 The first was inducted by Andrew, who spoke about knowing the hard work which goes into organising pinball shows, and how the first inductee this evening had brightened up the dull Winter months by organising two annual pinball shows where all the proceeds went to charity, and was hard at work on the third show for early 2012. 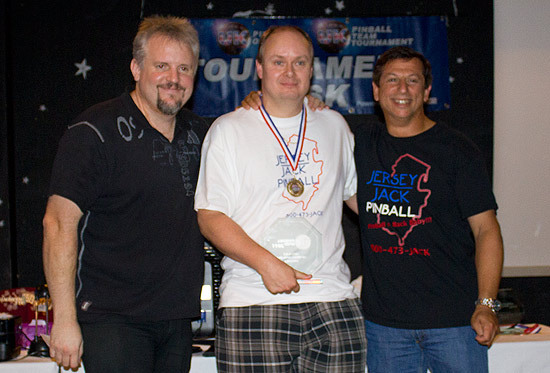 The first new member of the UK Pinball Group Hall of Fame was Will Barber, organiser of the South Coast Slam. 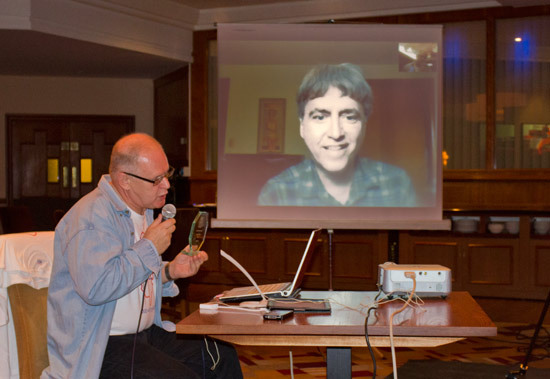 The second inductee was introduced by Gary Flower and they appeared live at the show on a video link from Seattle. 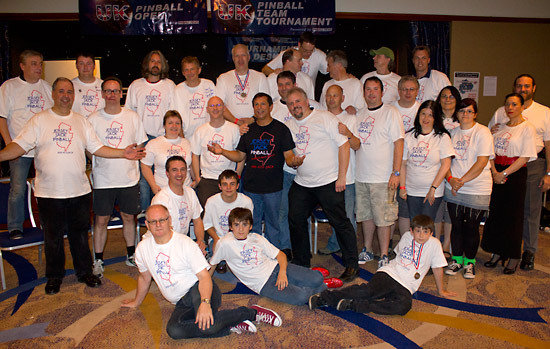 One of the best pinball resources on the internet is undoubtedly the Internet Pinball Database, and this year the UK pinball community recognised the great work done by one of its founders and the man who spends so much time researching all the machine details and pictures held on the system to make sure they are totally accurate. The second inductee of the evening was Jay Stafford. 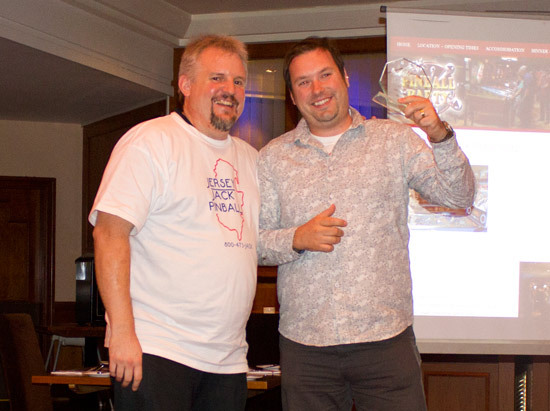 Jay spoke to say how honoured he was to be inducted and thanked the UK Pinball Community for the award. His Hall of Fame membership certificate had been sent to him in advance and he showed it to the the audience. 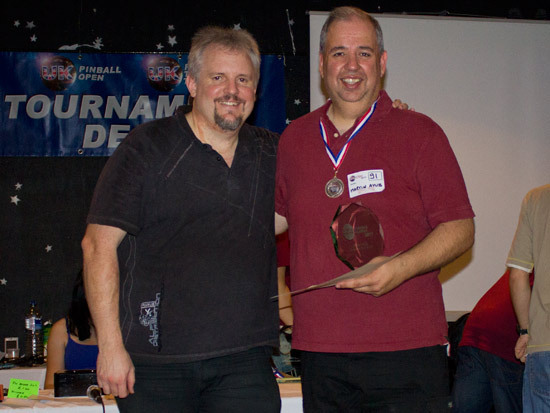 The final inductee was introduced by Pinball News Editor, Martin Ayub. He spoke about how, while many of us muse about the idea, one man had gone ahead and done what seemed an almost impossible task. 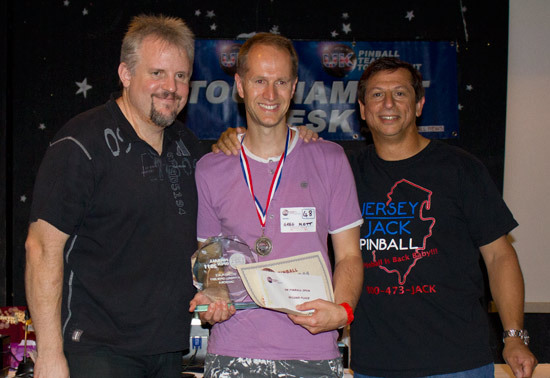 But he had done it, by bringing together the best in the business to create a new brand pinball company from scratch, with the brief to design the best games possible. 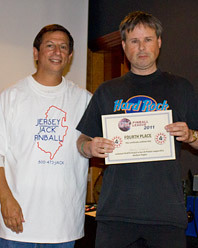 The third inductee into the UK Pinball Hall of Fame was, of course, Jack Guarnieri. With the awards and inductions completed, it was the part of the evening where the audience heard from the dinner's guest speaker. 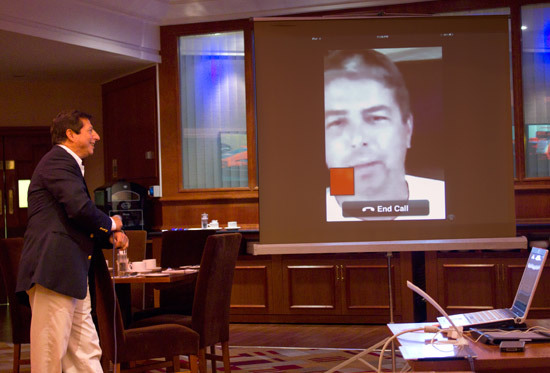 Jack began by linking live with Joe Balcer so that Joe could talk to the audience and tell them the latest news from the design team. Joe thanked the audience for their support for The Wizard of Oz project and promised to be back next year with the game, which brought applause from those assembled for the meal. Jack then started his talk by thanking everyone for his induction into the Hall of Fame before talking about the level of media interest in pinball at the moment and how the game doesn't belong in a museum but should be constantly in the public consciousness. 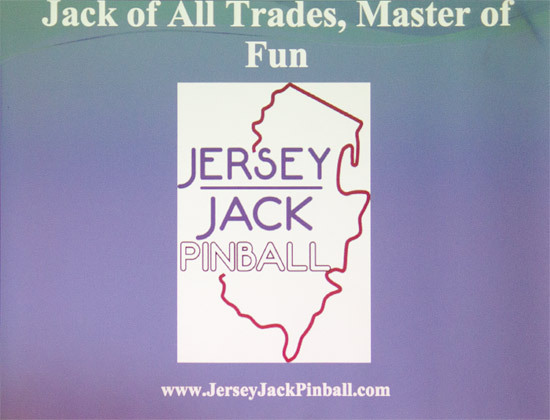 "Jack of all trades, masters of FUN" was the company slogan which Jack said echoed his emphasis that the one thing pinball has to be is fun. After speaking about his family, his faith and his charity work, he turned to the reasons he decided to start a pinball company. Before he could start, Jack said he needed to get a lot of resources in place, because despite being in the amusement business for 36 years and starting as a pinball mechanic in 1975, he didn't know anything about building a pinball machine. So he went out and got the greatest team to build the games. He went through the processes put in place for potential buyers and explained how he wasn't going to build 1,000 games on spec, but needed firm orders and commitment from buyers to ensure the project went ahead. 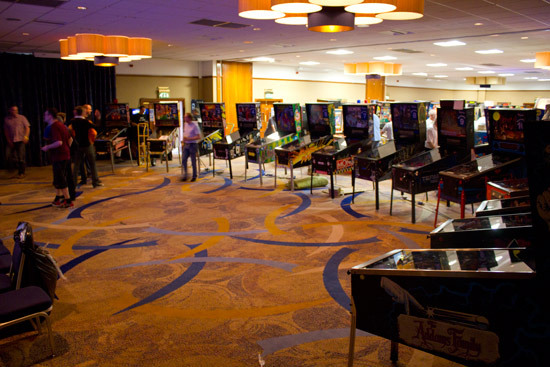 He announced he had now sold all 1,000 Emerald City Limited Edition machines, saying the market for his games is not the same market as Stern Pinball's market. He likened The Wizard of Oz to a Bentley compared to Stern's Kia, adding that JJP aren't building a game with a calculator, but with passion. 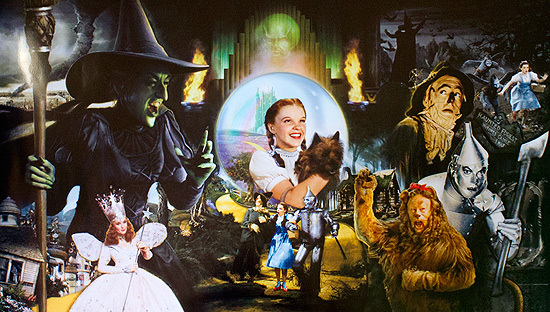 While acknowledging the theme wasn't well known in some countries, The Wizard of Oz, he said, appeals to the whole family, and women in particular, making it a much more acceptable purchase than a macho cartoon super-hero themed game. He was sure it would make everyone go "Wow!" when they saw the finished product, because what had been revealed so far was just a tiny fraction of what's in the game. Jack then played the audience the video of the white wood being played from the Pinball News website before describing some of the features on the playfield. He said the shot around the house is stronger in the video than it will be in the game. 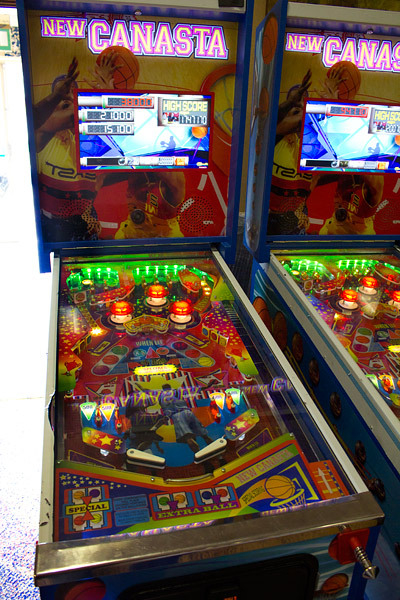 The feature set included 2 upper playfields, 5 flippers, 4 pop bumpers, 2 magnets, some kickers and doesn't have a tradition 'Italian bottom' flipper area. Jack then showed a colour version of the left cabinet side art for the first time. This is not yet approved, so it may change slightly before production. None of the artwork created by Jerry Vanderstelt was based on existing artwork, but was all created by him, in some cases using composites of different portrayals of the characters to produce a result which, it is hoped, will become part of the style guide issued by Warner to other licensors. 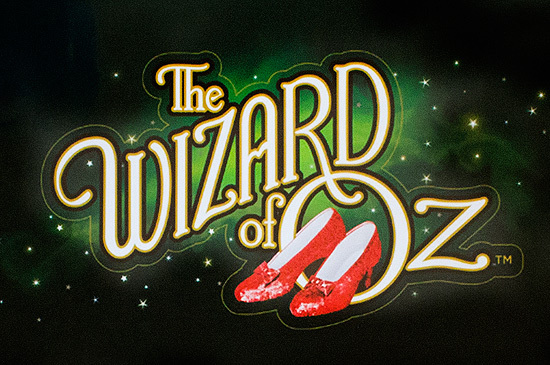 During the show, Jack had shown a video on his phone of Dorothy's house made in metal, spinning round until it stopped and dropped down onto the playfield, when the Wicked Witch's legs extend out from beneath. Jack still had one more piece of colour artwork to show the audience. This backglass image shows the combination of the glass surround and the image on the LCD monitor in the centre. The monitor will also show scores, movie clips and custom-made animations currently being designed by a graphic artist in Belgium in conjunction with Greg Freres. Jack said a large part of the monitor's usefulness will be to keep other players or spectators entertained during the game. Jack brought with him two 'translite' posters of the backglass/monitor image which he signed and donated to the charity raffle. One of the features included in the game is an interactive topper on the backbox. The Emerald City Limited Edition will have a different topper that fitted to the regular version, but Jack stressed that all the games - Limited Edition or not - will have the same features and the same programming. No mechanisms, rules or modes will be removed for the regular model. The game will also include LEDs for lighting effects as standard, which Jack described as "the right kind", suggesting they won't suffer from flicker problems, and he reiterated that the game would be fitted with non-glare glass and a shaker motor. 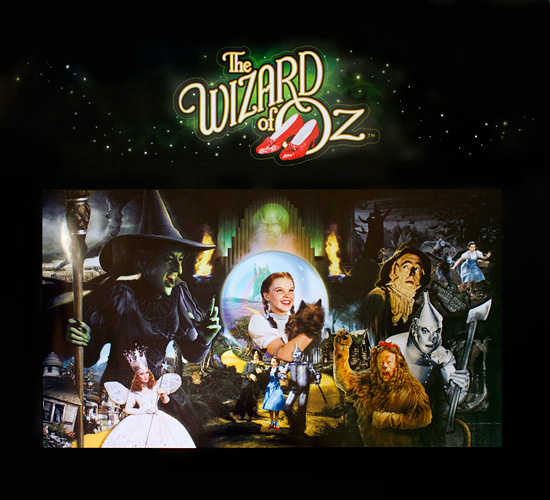 Talking about the board system used in The Wizard of Oz, Jack said they had taken a couple of months to design their own in-house board system, which, he said, was powerful enough to drive five of his competitor's games simultaneously. There would be a power/driver board, a computer board and a stereo sound board in the backbox, while the cabinet will include a headphone jack which will also be able to connect to an external stereo audio system. 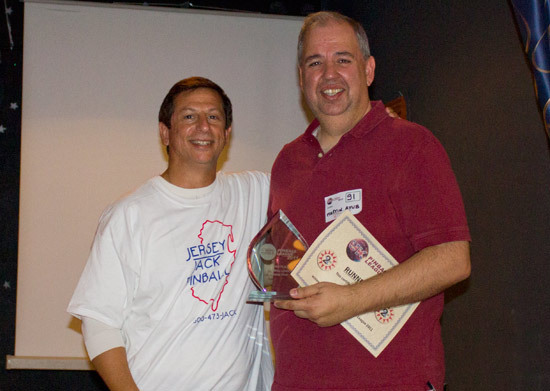 Next Jack announced a new UK distributor for JJP products. 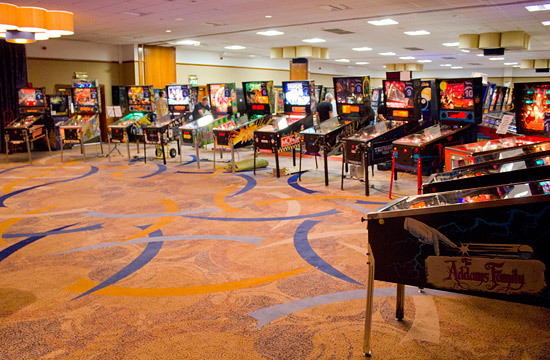 Pinball Heaven will join JJP's list of worldwide distributors we reported earlier, while Andrew's Heighway Pinball and The Gameroom Company both become authorised resellers for the UK and Ireland. Jack also pledged not to introduce any controls or methods to restrict where his games can be sold, or operated. As a Stern distributor, he said he sold many games overseas when he probably wasn't supposed to, and saw his business to create the best games he could, not put limits where they could be sold. He confirmed the game didn't have any camera fitted and spoke in general terms about the possibilities of connecting games through the internet to record high scores or add avatars for players. He didn't talk about any specific plans for including these ideas though. 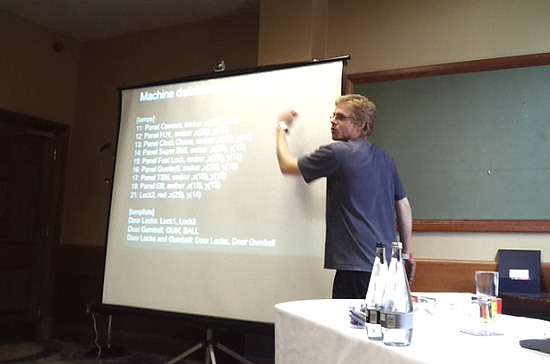 You can hear Jack's talk at the UK Pinball Party for yourself. Just click the play button on the audio player below, click the link to the MP3 or right click it to download the file. 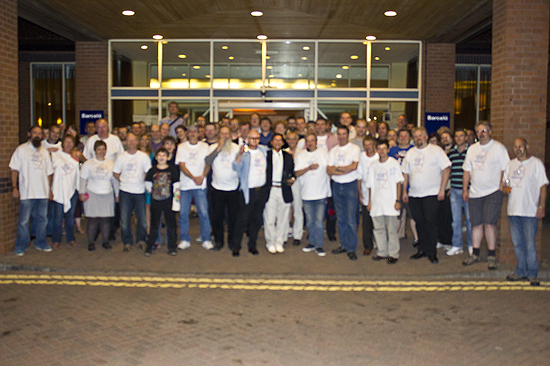 After Jack concluded his speech, everyone congregated outside the hotel entrance for a group photo. As expected, Sunday duly arrived, but the final day of the show didn't see any slow down on the competitive front with three events taking place and two more reaching their conclusions. 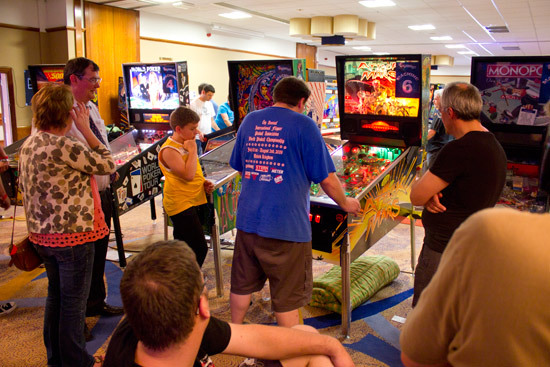 When the Party re-opened at 10am, the national finals of the UK Pinball League began in the Westerburg Room. 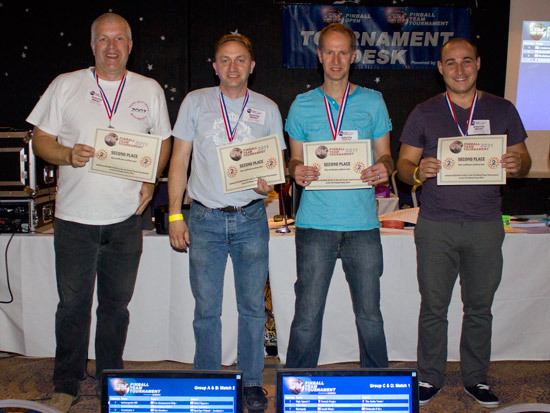 Five machines were set up and the top players from the five regional leagues - Scotland, North, Midlands, South West and London & South East - played in pairs to record scores which would then be ranked to decide the winners. 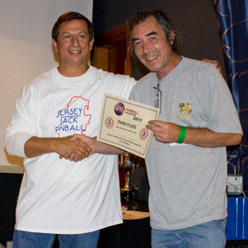 This mirrored the format of the regular regional League meetings which take place from September through to July each year. The competitors in the League final were split into two groups - one starting at 10am and the other at 11:30am. This was so players would also have time to compete in the second of the day's tournaments. 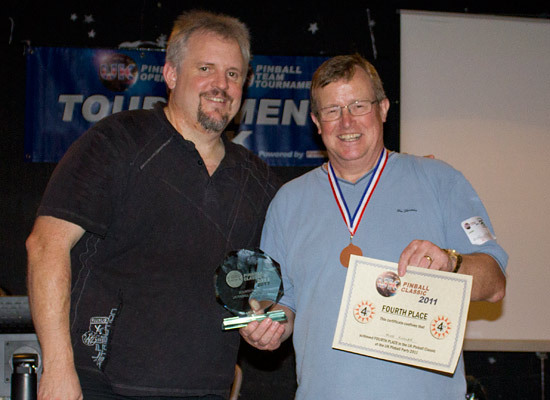 This was the third year for the UK Pinball Classic which is played on eight pre-DMD and pre-alphanumeric machines and is run by Dave Rolfe - no stranger to organising tournaments on these types of games, as he runs both the Welsh Classic and the Welsh PinGolf Open. 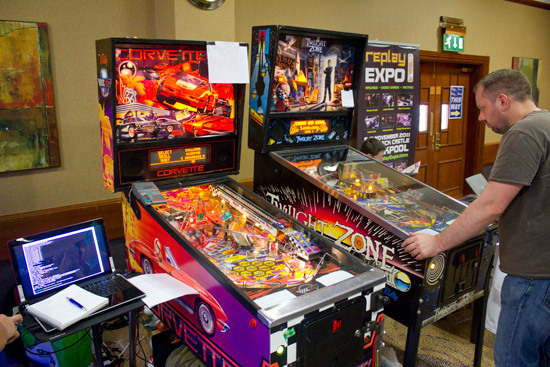 The UK Pinball Open games were taken out of the tournament area and replaced with the Classic machines early Sunday morning before the show opened to the public, ready for the start of the tournament at 10am. When the qualifying round finished at 3pm, the players with the highest score on each machine went through to the play-offs. 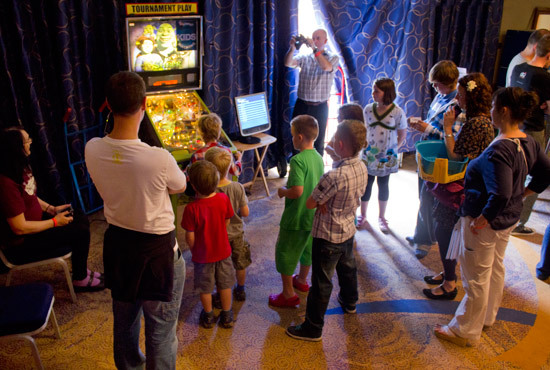 Players could enter as many times as the wished at £1 ($1.60) per entry but could only qualify on one machine. If they came out top on more than one, the machine where they had the greatest lead over the second-placed player was the one on which they qualified. In that case, the second-placed player on their other machine(s) went through in their place. 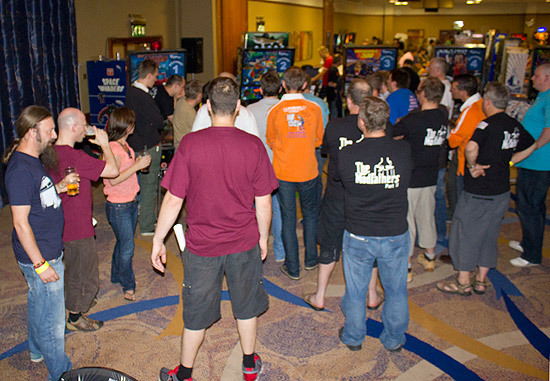 Once again, the UK Pinball Classic proved to be very popular with over 500 entries during the qualifying round. 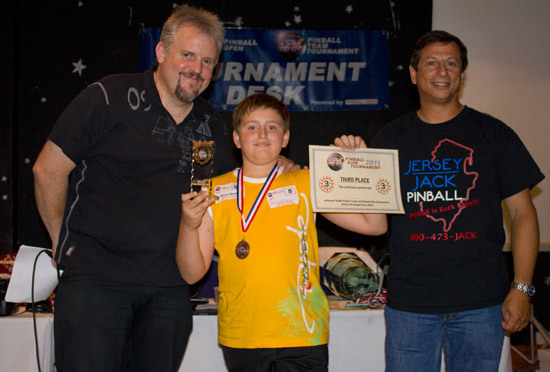 The third competitive event of the day was Sunday's UK Pinball Kids Tournament. The previous day's Shrek as been returned to the free play area (and had Family Guy software installed to turn it into Shrekly Guy), and Star Wars Episode 1 had come in for the Kids Tournament. 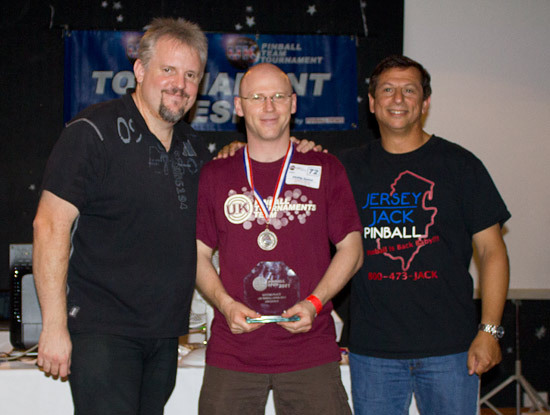 With all three tournaments running, the first to finish was the UK Pinball League final which was won by League Coordinator, Greg Mott. 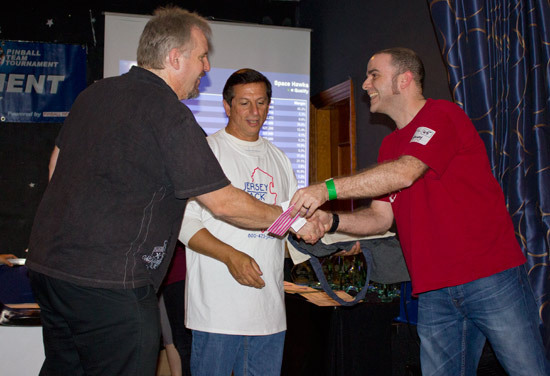 The winner for the past two years, Martin Ayub was second, and there was a tie on points for third between Garry Speight and Nick Marshall but Garry took third with more higher scores than Nick. 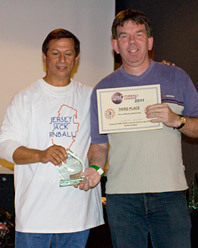 Along with the award to the top players in the national final, there were also awards to the top regional players. 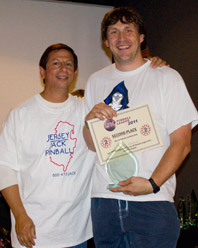 In addition, awards were presented to the best female player in the League which went to Janine Timpson (who wasn't present to collect it) and the best young player which was won by Martyn Raison. 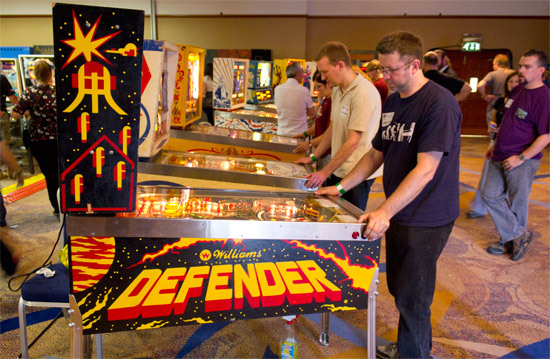 The two semi-finals were played on Fireball II and Defender. The final was played on Zaccaria's Fire Mountain which was brought in just for the final and the 5th-8th place playoff match. 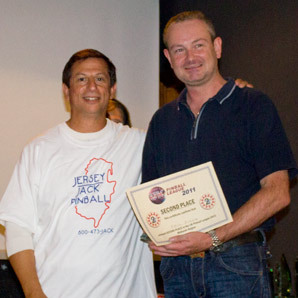 The game proved to be brutal with many balls draining without the players having the opportunity to flip it, but Andrew Foster managed to get a decent play and racked up a winning score of 264,540 with his five balls. Martin Ayub had one reasonable ball, but never flipped his last three. Nevertheless that was just enough to give him second ahead of William Dutton and Mike Kindler. 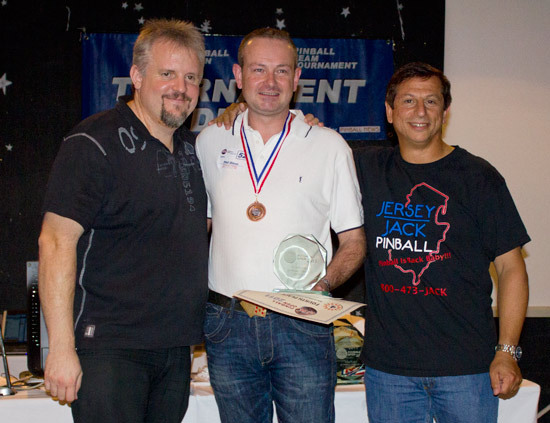 In the 5th-8th place play-off, Franck Bona was triumphant to take 5th, creating a good lead over 6th placed John Higgins with Shaun Harvey close behind in 7th and Eric Rousseau 8th. Also ending today were the two high score competitions. 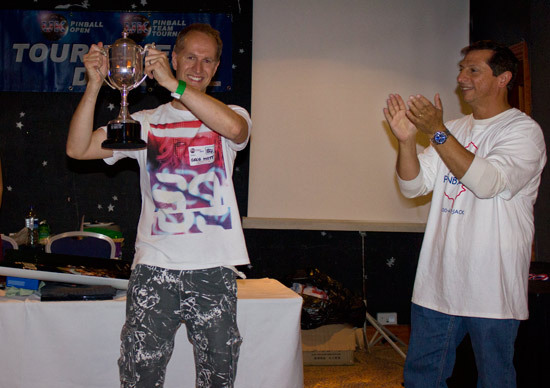 The first, the UK Pinball High Score Shootout run on Cactus Canyon, was won by James Watson who won a trophy which - due to damage - was awarded to him the following weekend. 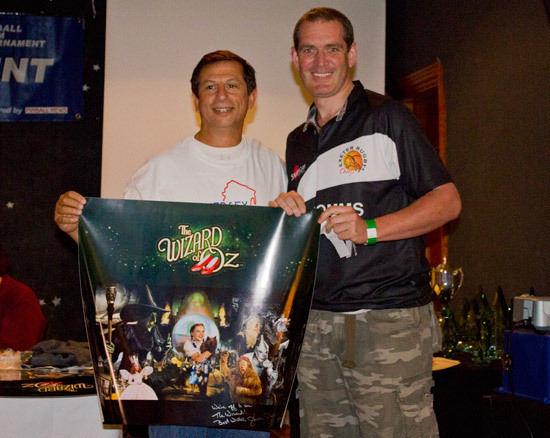 The neighbouring Monster Bash was host to the Marco Masterplay high score competition which was beaten into submission thanks to a monster score by Nick Dean. 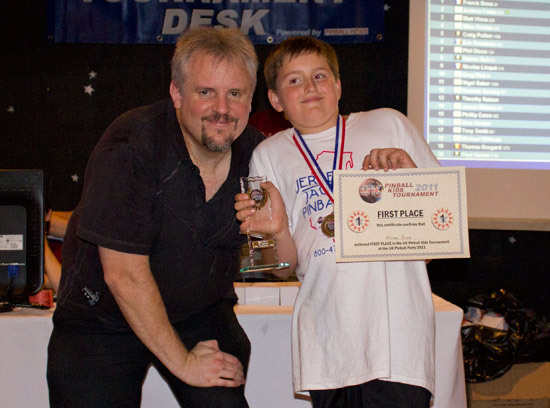 The only remaining trophies to be awarded were in Sunday's UK Pinball Kids Tournament played on Star Wars Episode 1. 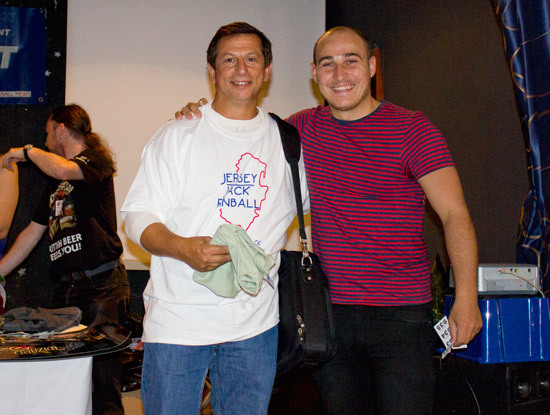 The final event to take place on Sunday at the UK Pinball Party was the charity raffle in aid of Great Ormond Street Hospital for children. 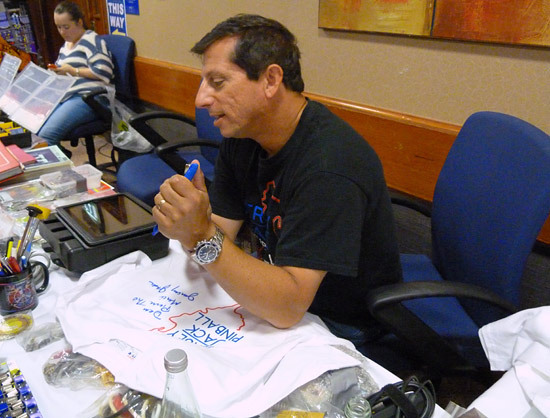 Prizes were donated by - amongst others - Jack Guarnieri, Marco Specialties, Simon Phelps/SPC and Pinball News, as well as the grand prize of a Pool Sharks pinball machine. yet another Marco prize pack winner! 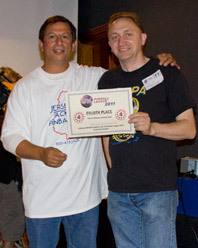 And with that we bring this report from the 2011 UK Pinball Party to a close. 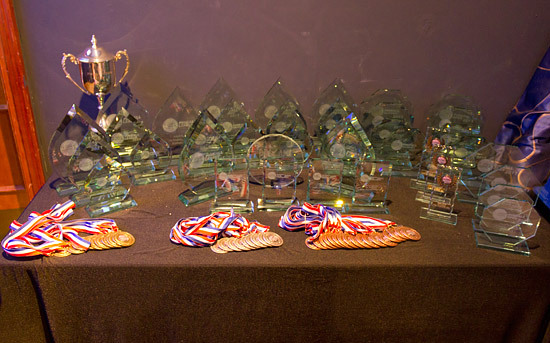 The machines were packed away for the journey home and the various winners looked back on a successful weekend. 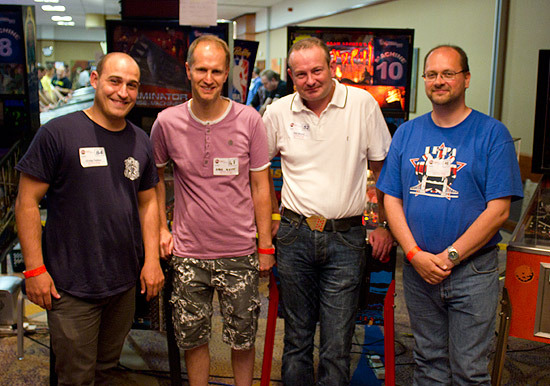 Everyone else hopefully enjoyed playing some new games and rediscovering some old favourites, and got to meet up with pinball friends, both old and new. 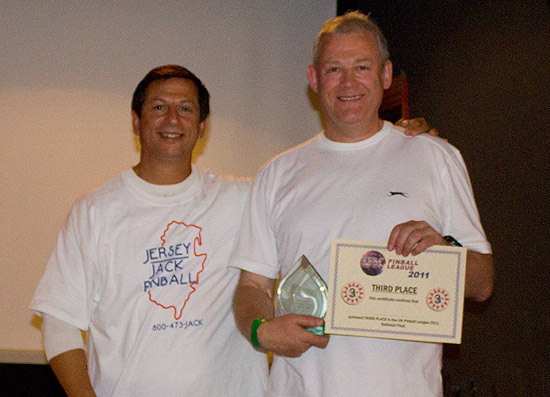 The UK Pinball Party will be back in 2012 and naturally we'll be right there to bring you all the details.